Trusting the professionals at RainSoft to install a no detergent laundry system in your home can help you to save significant amounts of energy and money that you didn’t even realize were going to waste. Our sophisticated CleanStart® laundry system uses controlled amounts of Activated Oxygen to clean your laundry in a way that requires little to no detergent, and no bleach or fabric softener. That’s because Activated Oxygen is a potent natural disinfectant, allowing it to achieve equal or better results than more traditional methods of washing your clothes without resorting to using harsh chemicals. And, since the oxidation process causes the Activated Oxygen to revert to simple oxygen, the only byproducts of our CleanStart® system will be clean clothes and fresher smelling air. 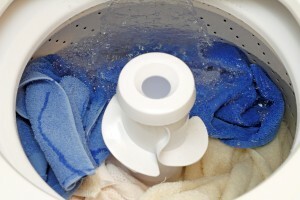 Detergent savings – You will have little or no need to purchase detergent, fabric softener, or bleach again. Reduced energy costs – Our systems function using cold water, helping to save the energy typically used to heat the wash water. Longer lasting clothes – By eliminating the need to use harsh chemicals that damage fabric over time, the CleanStart® system can help to extend the life of your favorite clothing. More thorough cleaning – Since the oxidized water itself becomes the cleaning agent, the rinse cycle of your washing machine essentially becomes a second cleaning cycle. Universal installation – Our CleanStart® system is compatible with virtually every make and model of washing machine on the market today. When you combine our product’s multiple ways of helping you reduce your expenses, our CleanStart® system can help you save up to $6,500 over ten years, making it an outstanding investment for your home. For additional information about having a CleanStart® no detergent laundry system installed in your home, be sure to contact your local authorized RainSoft dealer today.